Lindner is widely regarded as one of the "greatest players" in Scottish women's football. Former Glasgow City forward Kat Lindner has died suddenly at the age of 39. The team postponed their game on Sunday, citing a "bereavement within the GCFC family". Later in the day it emerged that German-born Lindner - the partner of club co-founder Laura Montgomery - had died suddenly on Saturday. "The club is devastated to announce that Katharina Lindner (Kat), sadly passed away," said a City statement. 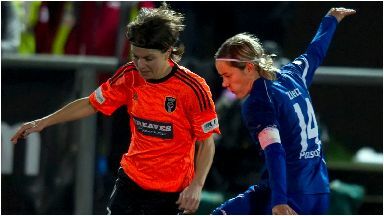 Lindner - who the team described as "one of the greatest ever players in the Scottish women's game" - moved to Scotland in 2005. She appeared 173 times for City, scoring 128 goals. In total she helped the club win five league titles, two Scottish Cup and two League Cups. Retiring in 2011, Lindner became a lecturer at the University of Stirling specialising in gender, sport and queer theory in the media, communications and culture department.